...unless someone recreates the Nerve Gear from SAO, but then we'd probably be trapped in the game because of the creator going psycho and wanting to kick things up a notch. But this isn't SAO and there are no signs of psycho creators, it's Is it Wrong to Try to Pick up Girls in a Dungeon (aka DanMachi) once again as I try to atone for the pretty rubbish reviews of old for better ones that will actually tell you what I think of the anime/manga, and Danmachi gets first treatment! Journey through a time where you can live as an RPG player (in an anime), going into dungeons solo or joining a party, defeating monsters of all types and what not in order to level up and gain new abilities, as well as gathering their drops and making a living for yourself by giving crystals to the guild in exchange for money. You get the idea (if you're familiar with RPGs), but before you can do this, you have to be in a Familia. It's like a clan with a God or Goddess from various mythologies being the head of it. Bell Cranel, our white-haired and red-eyed MC is in the Hestia Familia, who is the Greek Goddess of the hearth, family and domestic life to add some history into her background. So you'd think she'd be a humble and kind Goddess, but she's quite the opposite; she's short but loud, and is totally in love with Bell (who's of course oblivious to this and just treats his Goddess with respect like a good boy), and is not afraid to shove her chest into his face. She can seem a bit desperate and possessive at times, which kind of annoys me at times, but hey it's part of anime right? So that's Bell and Hestia, and a basic idea of what to expect from the story in the world of DanMachi. But, I hear you ask, what about the title? How is it relevant to the anime? I still ask that about Bleach, but the good thing is, this title has some relevance! 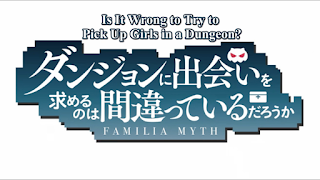 Bell's grandfather basically tells him that the best way to pick up girls is to save them in a dungeon, but as with everything, this doesn't go smoothly for poor Bell. Instead his very close encounter with a Minotaur when he first starts out his adventure results in him having to be saved by the strongest female character, who instantly captures his heart and admiration for her skills and strength. From there Bell is determined to get stronger so as to catch up to the girl who saved his life, but again this has its obstacles and a hint of jealousy from a specific Goddess, for other people become intertwined in Bell's story, no matter how good or bad they may be; they just don't like his determination to get stronger quickly. It adds depth to the story because it builds on Bell's character and on others, and you see how some people feel about a newcomer that is somewhat special, making them look like jokes even though he doesn't take things very seriously, like when we play an RPG; there's that one person who starts off after us but seems to get stronger quickly without all the grinding. The good thing is is that DanMachi's story doesn't solely take place in the dungeon where Bell continues his adventure; we get to see the city of Orario and more of the RPG element play out as , as well as the other Gods and Goddesses who feature in the story. Nevertheless, there are plenty of good action sequences both in and out of the dungeon with Bell and co, and RPG moments that you can relate to if you've played any of those games. Using the elements of an RPG and delivering it in a way that lets you see how awesome yet difficult it can be as close to reality as possible (for now) is what makes DanMachi. Without it, you'd probably just get some guy trying to get a girl who's way out of his league whilst slowly building a harem (without him being aware of it given his nature) to the point where he's at Kirito-level harem. But this brings part of the comedy side into DanMachi because each girl is different in personality, and Bell's reactions to some moments with them are priceless (if you've already seen this, you'll know which moment I'm talking about in particular ^-^). Despite it being a good anime, there is a downside to DanMachi; the ending in my opinion lacks some depth, in the sense that, there could have easily been another episode. Throughout DanMachi, Bell's grandfather does feature in it where he talks to a young Bell pre-adventure, which has some sort of link to the final episode, but not strong enough of a link to let you understand its significance to a particular scene (I shall not spoil) and the second half of the episode. I may have to read the light novel in order for it to make sense to me, but some of you may think that the final episode is fine which I'm not fussed about. Nevertheless I enjoyed re-watching DanMachi (without waiting for the episodes to release this time) with its great story and characters, but the final episode could have been far better to make for a more fulfilling ending, or another episode altogether.